When I stumbled upon Ashley’s McLaughlin’s blog Edible Perspective years ago, I was first drawn to the stunning photography. Ultimately, her sunshiney personality, amazingly creative recipes, and down-to-earth writing style hooked me in. To date, Ashley’s recipes are some of the healthiest and most delicious recipes I’ve tried from any food blog – and I’ve visited a lot. The girl taught me how to make almond butter for goodness sake! Stop by Ashley’s blog for a wealth of information on gluten free and vegan cooking, as well as desserts that always fall on the healthier side – my favorite kind. Edible Perspective started after making a cross-country move to Colorado with my husband, Chris. When we first moved out west we were lucky enough to stay with Chris’s brother and wife for a few months as we furiously hunted for jobs. To return the favor to them, I cooked our weeknight dinners and decided to document my creations along the way. It was at this time when I finally decided to pick up Chris’s clunky dSLR camera and put down my trusty point-and-shoot. I never imagined what it would evolve into! I focus my cooking and eating on real, whole-foods and avoid highly processed foods whenever possible. Not only does eating this way taste better but it also makes me feel better. However, when it comes to food I don’t set rules or guidelines, I simply take things one day at a time. I enjoy supporting local and organic businesses and am not only passionate about my personal health but also the health of animals and our environment. As a gluten-free non-meat eater, I’m frequently asked what it is I can actually eat. This always makes me chuckle a bit, because I eat a much wider variety of foods now than ever before. My meals are flavorful, wholesome, and fulfilling and they leave me feeling happy and energized. Sweets are of course included! Growing up I was somewhat health-conscious but nowhere near as educated as I am now. I wasn’t the biggest vegetable fan, typically ate meat twice a day, and definitely ate my fair share of processed foods. My real interest in health and food started about 6 years ago when my thesis research began on the topic of Food + Architecture. I focused my research on how industrialization has affected both industries [ie: quantity over quality]. There are many more commonalities than you would think! This got me highly motivated to learn everything I could about our food system and has changed my life for the better. I am egg obsessed. Farm fresh eggs are simply the best, and I eat them nearly every day. Other favorite foods/ingredients of note are: cinnamon, oats, almond butter, kale, lemons, and any seasonal fruit. My taste buds definitely change with the seasons! Yes! Most definitely. I truly enjoy sharing what I have learned about food with my readers through my recipes and photographs. Also, if it wasn’t for the blog world I would have never started eating raw kale salads, making my own nut butters, trying and loving tofu, figuring out my body works best on a gluten-free diet, and so on. I’m incredibly thankful to have found other bloggers who put out impressive, educational, and delicious content every single week. What are a few of your favorite recipes to date? 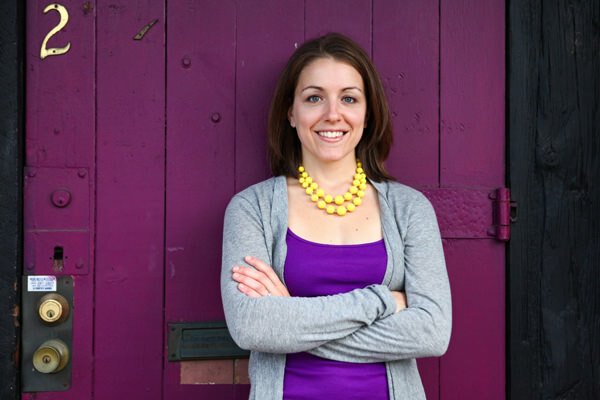 Ashley is 14th in a series of spotlights on healthy food bloggers. Be sure to check back next Sunday to meet another healthy food blogger in our midst.